No matter how young or old you are, you know who Kermit the Frog is. Everybody at some point watched the singing and dancing frog that was created by Jim Henson. No matter how much you might have loved him, if you were honest with yourself he didn’t look like much of a frog. Well at least he didn’t based on what we grew up thinking frogs looked like. Recently though things have changed for those of us who thought Kermit was a rather odd looking frog. The Costa Rican Amphibian Research center recently announced that they have discovered a new species of glassfrog. The new species of frog, whose scientific name is Hyalinobatrachium dianae, was discopvered in the Carribean foothills of Costa Rica. Brian Kubicki, who is the senior author of the study, named the new species after his mother Janet Diane Kubicki. The Kermit look-alike will now join 14 other glassfrog species that currently live throughout Costa Rica. However, what sets this species of glassfrog from the other 14 species is it’s strange call, the one that males use to attract females. 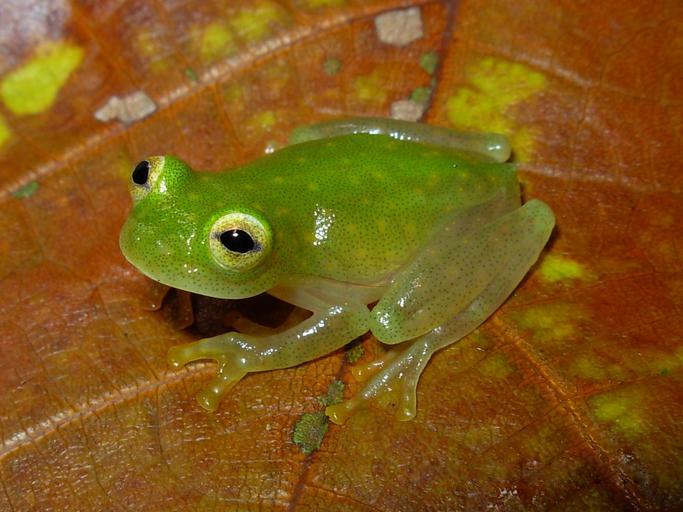 The Kermit look-alike uses something similar to an insect’s call rather than other glassfrog’s calls. The sound it makes is similar to a metallic whistle that involves a series of rapid pulses.